Discussion in 'Aesthetic Modifications' started by Crocky, Jul 13, 2014. Decided to try and force patina on my copper cartel mod and apo airflow ring. I should have taken pictures along the way but this is the final stages. I let it sit for about 10 hrs. Rotating every two or so. Took the cover off and now letting it dry out. Once the salt is off I will put a few clear coats on and light sand then re coat. 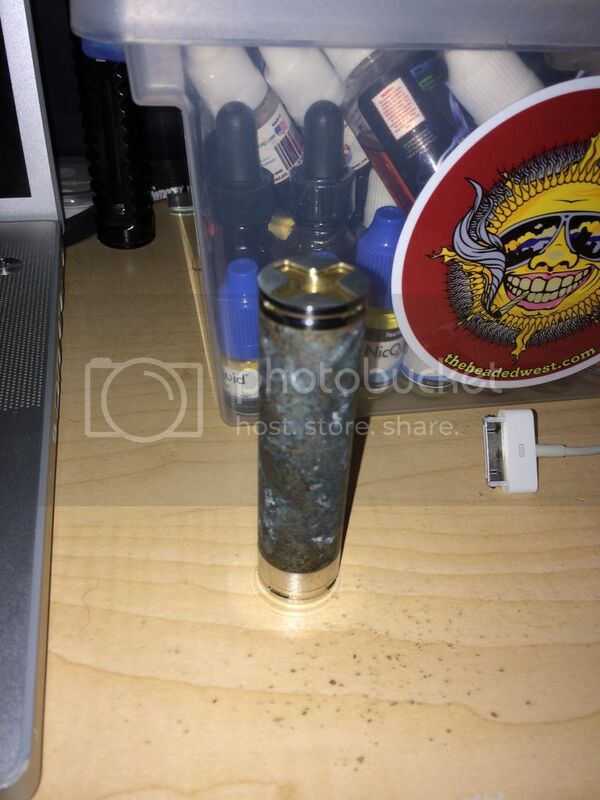 CashNVape, Semi Reduction, MKPM and 6 others like this. Looks interesting. Please describe your process and post some more pics! Arizona, Scuba-Matt and Cessnapix like this. nice! I'm contemplating doing this to a copper nemmy.. I like it polished and when the natural patina starts to set in I find myself grabbing the Polish to make it shiny again..no need for polish after this process.. love the colors that come out of it. Scuba-Matt, Frawg and Crocky like this. Wow you had way better luck than I did. I tried a couple of mods this past winter and got a much darker finish. I was trying to achieve the blue you got. Perhaps I left it in too long but everytime I washed the salt off the blue would come off as well so I would repeat. I never did get around to finding any wax or clear coat though. Number3124, Frawg, PondScum and 1 other person like this. Number3124, driver379 and glassgrl like this. What did you use for a clear coat? I think My main problem was that I didnt clear it right off. The light blue comes off realy easy just handling it. I just used a clear enamel spray. I might do one more coat just to make sure when I sand I don't hit the patina. Well I am not quite sure how happy I am with it but it is what it is unless I want to sand it down and start over and I am not that unhappy with it...LOL. I think if i had kept it in there for a full 24 hrs instead of 10 it would have lightened up considerably. But overall not too bad for my first time trying. Semi Reduction, Oggy, driver379 and 13 others like this. Even though you're not sure how happy you are with it.......it is still gorgeous. Now I am gonna have to get a copper mod. Number3124, skitlz_oh_geezy and Crocky like this. Yes it does look Really Good. I like that look! I polished down an old vamo to the copper and then did the same thing. but like I said I didnt clear coat it soon enough and handling it wiped off the light blues. I looked for some canuba wax than went to home depot and was in a hurry and could not find the clear cote. I did it to a Brass Cavelara 18500 tube also but it came out more of a brown marbled look. I polished it off to try it again but tnever did. It had the blue under the salt but that washed right away from the brass. I left that in for a few days too roataing it everynow and then. It looked really blue all over the salt like your pictures but it must have been the brass? Not sure! shemmy, Frawg and Crocky like this. I've been debating testing this on a kick tube first to get a feel for it... I watched that video a ton of times and wanna do it. I think yours looks fantastic. The blues, turquoise, and golds are awesome! Aw come on just go for it and do the whole thing . If you do just the kick tube when you put it together it will show that it was done different. You can sand it off anyways, however it may pit the brass or copper a little bit. just teasing.. it is not that hard. I wish I would have saved my pictures the vamo came out almost identical. It was a black or smock gunmetal color vamo that i polished and it has a copper costing under it where they plate it. Thanks all, well I ended up stripping it and going to give it another go and see if i can get it lighter with more pattern so to speak. Figured might as well do it on this mod. We will see how it goes. I will keep it updated in this thread. Read some on mustard and ketchup patina too but not sure if that is for copper too or just brass. awwwwww....man that looked so sweet to dude! BUT HEY IT IS YOUR MOD!! Are you going to use the amonia vineagar salt or do you have something else in mind? The more salt I found the more blue. The longer I left it in it the darker it got also. There is a site you may have found with a google search that sell some chemicals that will give you different shades also, from yellows to geens and blues, but honestley the stuff I have seen with vinegar, amonia, and salt came out as well. I read that non iodione/kosher salt is better, but see no difference. please keep us informed.... please! I want to try it again before it gets too cold to do it outside. It stinks inside even with the cover on. Not sure yet. Read some stuff on mustard and ketchup I might try but if not I might try vinegar instead of ammonia this time. Just need to figure out if longer makes it darker or lighter. hitman4274 and Cessnapix like this. It made it darker in my case. I used a combo of vinegar and amonia though with salt in the bottom solution as well. Again the key seems to be the salt that I could see. I just could not get it to stick very well. Soaking the thing did not help either. A light mist with warm solution on the bottom so gasses would rise off helped. I would like to be able to achieve what that guy had in the video! shemmy, anavidfan, Semi Reduction and 13 others like this. That's looking great! I have a brass and a copper 4nine on the way to me to play around with forced patina agian. When I did it on my Origin clone, I did it a few times, and my favorite results came from amonia and deionized salt in the container, and I made a slushi of amonia, white vinegar and sea salt to coat the mod. I didn't clear coat it since I like the fact that it continues to age with time and use, but I'm trying to sell it now since I only bought it for my Aqua, and I'm trying to sell it with it cause of the capacity. shemmy and Crocky like this. I like it! Is the red is where you had the mustard? Just curoius. @Gonzi - I had done about the same process as you dis, but didn't get any blue to stay on the brass. Some day I need a do over. Thanks! Yes where the copper is showing in different hues that is where I put the mustard. Good to know thanks! Must be the vinegar in mustard, and salt? Plus it stays on better than salt. You could force a design out of where the mustard was that is why I asked. However I like the randomness. 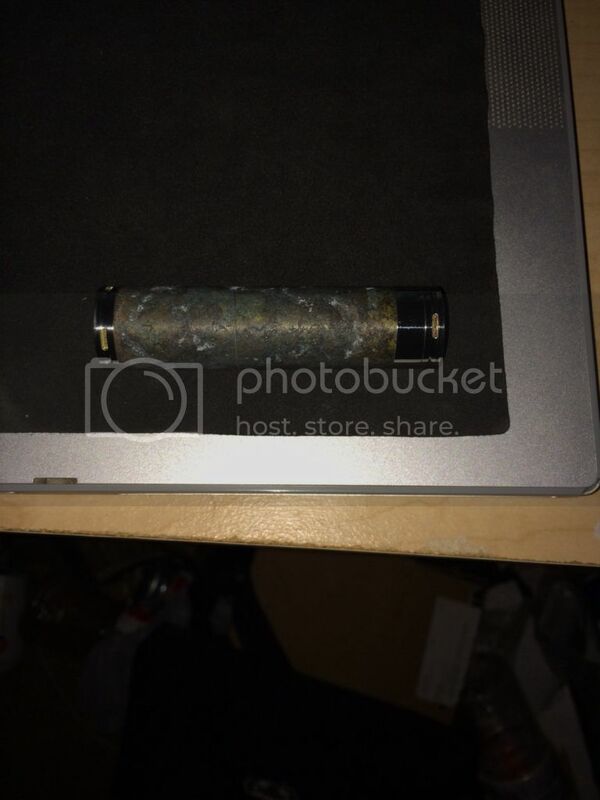 If you want to familiarize yourself with patina process and not ruin the look of a mod, get yourself a few cheap pieces of copper plumbing pipe, polish them up to your current color on your mod (or close to it) and then try your hand at the patina process. Lots of different things produce different colors & different results on copper, brass or bronze. End caps (especially the firing button on the copper nemesis clone from Hcigar) are often copper plated over steel or brass, and that actually can affect the color you end up with. I have acquired a second copper nemesis used and will be doing some form of patina on it but I'm not sure just yet which way I want to go, I've seen everything from purple to blue, green, yellow, brownish red and I just can't decide what I want yet. Probably the purple/reddish one so I'll have to make a chemical purchase but that's easy. Finding time and a safe (clean) location to do it is the other challenge for me. Not that anyone here needs a reason to spend more money - but you MIGHT find some neat things here: http://www.caswellplating.com/ - They sell anodizing equipment, plating equipment, gun-bluing stuff, etc, The folks there are amazing and they have a forum just for getting help with finishes and such. It may help with patina-ing in some ways, but I do suggest at least popping into their forum to read some of their info on their products. AWESOME folks to work with too. If you're in the central NY area (Rochester-Syracuse) they're in Lyons. CaFF and Crocky like this. That's a dangerous site, my wallet ran away from me as soon as I clicked your link. driver379, Scuba-Matt and CaFF like this. Yeah I fully understand that, if I ever end up with the garage cleaned out of recyclables and other people's stuff I'd somehow find the money to get one of their 5 gallon anodizing kits and that's just the start of the wishlist. So I started my brass stingray 3 hours ago. At 2 hours I did a rotate and spray and salt. Just check it again, but didn't mess around. Will do in another hour. I had to re tape my kanthal, since at an hour it had sunk into the ammonia and salt a bit... We will see how that works out. I taped all my threads well, but I'm guessing I'm gonna need to polish the inside with bar keepers helper so I don't get voltage drop if the inside patinas a bit. If I like it I'll clear coat before hitting the inside, or I'm guessing I'll manage to scrub some off the outside as well, can always repeat if needed. It looked a nice camo type of brown splotches when I re sprayed and salted. I want blues I think, though. If the threads are clean, will some patina on the inside cause voltage drop? I will polish probably no matter, OCD, but anyone know if the threads are all that's important? I'm guessing I need to polish the inside? Any input is appreciated. I'll post pics, too. Crocky and Scuba-Matt like this. Voltage drop should only happen if your contacts are coated. Cleaning your contacts is a good maintenance habit to get into anyway. Scuba-Matt, Gonzi and Cloudy Peak Vapes like this. Thanks. Already have that habit. I love natural patinas on copper so I tape it all off, completely dissassemble and scrub with the Bar Keepers goodness fairly regularly. Always clean my contacts if they turn dark, or about weekly. So I should've vaselined the threads... it didn't look effective in the video, so I taped, and the tape is coming off. I know bar keepers will get it off. I'm just gonna have to figure out how to protect my patina. I'm guessing I'm going to have to start again. Also, what I thought was clear enamel in my garage turned out to be a blue clear coat? Test sprayed it thankfully, don't know how clear coat enamel in blue works? Not using it obviously. We shall see if I can pull this off without erasing my work. I guess experimentation is just that, and I can always start over, hopefully I'll pull it off. Ideas on scrubbing the threads without hitting the patina? Will I have to cover the threads and clear coat first, or any ideas on protecting the patina while I scrub? Don't wanna clear it immediately. So that was about ten hours or so. Polished with some car wax. Woke up, and wanted more, so I re sanded, not taking the patina of, but hopefully getting the wax off enough. It has been sitting for 3 hours already, and I used the coat hanger method for a stand. I can't get one splotch coated in salt, but the rest is so even I'm gonna leave it. Should make a nice pattern hopefully. We shall see. I also used a different container, it's an old pistachio tub, so the lid screws on tight. I think I'm gonna check occasionally to make sure it hasn't fallen, but I might just leave it sealed pretty much all day. It's bothering me that a dime sized patch is not wanting to hold salt, but if I mess with it it will all fall off, so I'm gonna try to make myself leave it alone, get some extra patterning. We shall see. It looked cool, I just wanted some deeper blues, it looked nice, though. Semi Reduction, silverbullit, Crocky and 1 other person like this. I use vaseline on the threads and for more and deeper blues, use sea salt and don't be afraid to leave it it for a few days. The worst thing that's gonna happen is that the salt will be caked on the tube a little bit more, but it will turn bluer and you can always sand it smooth, and since you'll have a deeper patina, less risk of damaging your work. As far as the inside of the tube, as long as your threads are clean and your battery still fits well, there is no need to remove any patina. What I did to protect my work before going to town on those threads with polish was to wrap the tube with clear contact paper that I had already at the house. Cloudy Peak Vapes likes this. Did you use a brown or yellow mustard..I see knives forced patina using brown mustard and it turns it a dark brown close to resembling a damscus finish. Direhavok, I used yellow foodlion brand mustard. I thought about sanding the area down where the us yard was to keep it a little lighter but I figured out that the longer mustard sits the darker is gets under it but exposes the outline of the mustard in the raw material. Looks great TBCAmor! The beauty of it is if you don't like it you can always do it again. I used Vaseline on my threads and lots of it. Worked a treat! Now after I did all that work I think I am going to sale it. . It comes with two extra tubes so I could do those as well but I think I will leave them copper in case I do decide to sale. Keep it up. It took me two goes at it to get it where I liked it. Alxx and Cloudy Peak Vapes like this. I was afraid I'd mess it up, as I have no patience and just don't do well with projects. That being said, it's not hard at all. I didn't Vaseline my threads, but rather taped them, which didn't work, so follow everyone's advice unlike my dumbass, lol. If you follow the video and everyone's advice you'll get it down just fine. Do it! Don't be scared..if you screw it up you just sand 'er down and try again. I actually sanded mine lightly the next day and repeated the process to get more color out of it. Not much, but some. As said in what I quoted, you can always sand it off and repeat. Anyone know where the best copper mod deal is right now? I just got this one done, still need to wet sand it and give it a few more clear coats. Oggy, WescottsVape, P1NkY and 8 others like this. That's awesome Gonzi. I really like the pattern you put on it. Is that electrical tape you used?